Range Rover Styling: VIP Design London’s styling and performance upgrades for the Range Rover make this urban beast just a little bit more ostentatious. The VIP Design Range Rover 600RRs conversion has made automotive styling even sexier! From the Range Rover 600RRs 22” alloy wheels to its 5-litre supercharged engine, it oozes performance and luxury from every angle of its muscular lines. 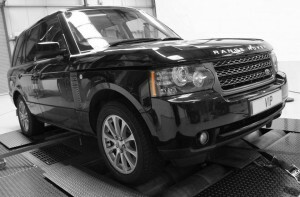 Range Rover Styling on the outside combined with the Range Rover performance ECU remap inside – style, substance and head-turning bling. What more could you want for the school run, shopping trips, business trips or tearing down those country lanes for weekend mini-breaks? The Range Rover 600RRs conversion has the space, flexibility and power for anything you want to use it for. Lowered suspension to your choice of specification all round massively improves your presence, poise and stance, while uprated suspension joints and bushes give you more control. The Range Rover high performance exhaust system is not only striking but its deep V8 growl will mean your friends will hear you long before they see you. Range Rover Styling: The stunning 22” alloy wheels with a high-gloss black and diamond machine cut finish are the perfect addition to your Range Rover – available in a choice of styles and finishes, just speak to the VIP Design team to find your perfect match. The exterior styling upgrades are brought perfectly to life with the upgrades under the bonnet working in perfect harmony together. The Range Rover ECU remap performance upgrade provides 600bhp and yields an extra 100lb of torque, dramatically improving throttle response and reducing 0-60 times by a whole second, improving driveability throughout the whole rev range. This is complemented by the full manifold high performance exhaust system, uprated Range Rover supercharger pulley, high-flow air filters and 200 cell catalytic converters. Optional extras include body-colour paintwork matching options, grilles and carbon-fibre trimmings according to your taste and personal style, and window-tinting from full black-out privacy to subtle UV protection. Whatever your requirements, VIP Design London will work with you to make your pride and joy even more special. Contact the VIP Design team now on +44 (0) 1789 774444 or email enquiries@vip-design.london to find out more.